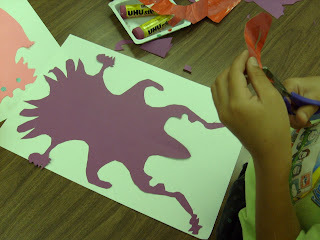 Deep Space Sparkle Art Lessons for Kids: Symmetrical Paper Cut Aliens! This lesson is based on symmetry so as far as teaching kids cool subjects, this one is perfect. In my opinion, there is nothing more pleasing to the ear than hearing a six year old explain symmetry, let alone saying it. It's a fun word...lots of syllables that when spoken correctly (or very near to it) earns a pretty respected look from parents and teachers. Kids LOVE this word. So now turn the word into creepy, strange, whimsical ALIEN and you have one hour of pure joy on your hands. Step One: Creating the Alien. Not easy for wee kids, but the older they are, the easier it'll be to teach. I have done this lesson with first and third grade students and it's a safe bet to say that the older kids got more out of the lesson. But the younger kids do, too. Take a sheet of construction paper and fold it in half lengthwise. It doesn't have to be lengthwise, but it'll make the alien taller. Please forgive the kid who folds it the wrong way. 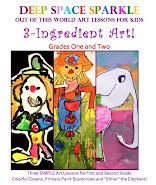 First option:For younger kids (1st-2nd grade), give them a crayon (not a pencil...it evokes to much perfectionism) and have them draw a line from the top of the paper down to the bottom. Not just any old line, but something that resembles a half of a head, half of a body, arms, legs, etc. A little talk on symmetry helps here. Explain how the children will only draw half a body. You will need to demonstrate this step repeatedly, but consider it an investment since the rest of the project is a breeze. Once the line is drawn, cut it out. 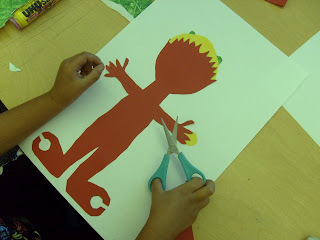 Second option: For older kids, give them a pair of scissors and instruct them to create their half of an alien body just by cutting. This ends up to be more of a surprise. When they open up the paper, they will have a big blob. Now it's time to turn that blob into an alien. It really helps to have small scraps of paper (get out your scrap box), sequins, googly eyes, plastic and aluminum gizmos...anything that the kids can use to decorate their aliens. But first things first. Glue the alien onto a piece of white paper. I like white because it provides a great contrast, but so would black. I just had an idea...you could, in another class, paint a planet or alien habitat on the background paper. Hmmm. Might try that next year. Tips: Many kids will cut the wrong side of the paper. They will end up with two pieces instead of one alien. I wish I had a picture of this common mistake but trust me, it'll happen. One way to fix it, is to glue the two pieces together. They'll have a line down the middle of their alien, but to be honest, there is no better mistake a kid can make. They really understand symmetry by trying. Did this with my art camp yesterday . . word for the day "symmetrical". Thanks for the great ideas!!! I can't wait to try this in the fall! 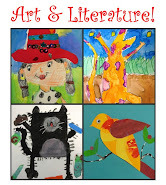 You are a masterful artist amd have a way with getting kiddos to express themselve. I love your blog so must I have given you an award. Stop by onepinkfish to pick it up. I also have an award for you at my blog and i love your ideas. I'm going to teach this lesson at camp today. So much fun! Thanks! We usually try to do an artist bio with our study. Sorry, no affiliated artist...just fun! I did this with my 1st grade "I hate art" son, and while the project didn't get as in-depth and I don't know that he got symmetry, this is the first art project that he has EVER done that he was proud of. Well actually the 2nd but the first was just stringing a few beads on a necklace. He was so proud of his alien that he wanted it on the wall. I need to look for some more ideas that I think he will enjoy but I wanted to say thank you for this one. Hi Patty -- I absolutely adored your blog! 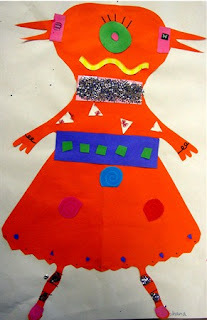 Recently, I tried your symmetrical alien project with my grade 3 students and they were really engaged. Instead of a white background, I got them to paste their aliens on black construction paper and given them oil pastels do a background for their surreal creature. To top it off, I bought some glitter glue for a dazzling effect. The kids went haywire over glitter glue. But overall, it turned out well. Thanks so much for such a creative idea! This was great, I did it with my 6 and 3 year old and they got a kick out of it! Thanks for the idea and tips!